Ford Postwar Flatheads: 1946-1953 Photo Archive by James H. Moloney is another wonderful collection of public relations and advertising photos from the Ford archive. All black and white, most with descriptions and details. If you have interest in Ford cars from the late 1940s into the early 50s, this is a great collection. My favorites might be the station wagons. The 1953 Crestline Country Squire, Model 79C weighed in at over 3600lbs. The exterior wood trim was actually still wood – maple, in fact. Though the interior wood was “heavy grained paper.” Definitely a different time in automotive history. No mention of cup holders or blue-tooth radio! 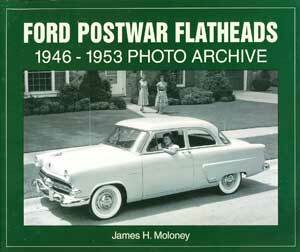 Ford Postwar Flatheads: 1946-1953 Photo Archive runs 126 pages and is a great collection to add to your library. $29.95 plus s&h.